Monday, April 3 | 10 a.m. and 7 p.m.
Boulder County and the City of Boulder will begin audible testing of the countywide emergency sirens at 10 a.m. on Monday, April 3. The test is the first of the monthly emergency audible siren tests, which take place each year on the first Monday of each month from April through August. The audible siren tests will occur twice on each testing day, at 10 a.m. and 7 p.m., on April 3, May 1, June 5, July 3, and August 7. Siren tests ensure that all systems and procedures are working properly during the season of peak flood danger. The tests also promote public awareness of the warning sirens located throughout Boulder County. The annual siren testing is a good reminder for residents to sign up for emergency alerts at www.BoCo911alert.com. Should Boulder County experience severe weather during one of the planned audible tests, the siren tests for that day may be cancelled. For updated information, visit www.BoulderOEM.com. Residents are encouraged to review their own emergency preparedness plans and discuss what they would do in the event of a flash flood or other emergency. For more information about personal preparedness, visit www.ReadyColorado.com. Used to alert residents to potential danger from a flood or other immediate threat, there are 29 outdoor warning sirens in place across Boulder County, including in Boulder, Erie, Jamestown, Lafayette, Louisville, Lyons, Marshall, Eldorado Springs, Superior, and the University of Colorado at Boulder. All Boulder County sirens undergo weekly tests throughout the year, using a software program that performs a “silent” test. For more information, visit www.BoulderOEM.com. The Town and its associated contractors involved with the design and engineering of the North St. Vrain restoration are excited to showcase the new state-of-the-art whitewater park in LaVern M. Johnson Park, for the 2017 Lyons Outdoor Games Slolem Competition. The design of the stream through LaVern Park is more suited for slalom racing, whereas the event's previous location, Black Bear Hole, is more accommodating to freestyle play-boating kayaking. The Town of Lyons has engaged in and promoted kayaking programs through its Parks and Recreation Department for over a decade, through various programming opportunities and facility development. This has assisted in the development of several local kayaking champions on the local and national scale. To continue its support for the kayaking community, slolem gates will be installed within LaVern Park in early April. Kayakers are welcome to utilize the gates as a practice course, through the weekend of the Outdoor Games. The gates will be removed following the event, during the weekend of June 3-4. The gates will only be up during high water, when tubing and fishing opportunities are limited or less likely to occur, or can be pushed to the side when not in use. Careful measures will be taken to ensure trees are protected when the gates are hung. Join representatives from the Boulder County Sheriff's Office, the Lyons Fire Protection District, and the Town to brainstorm strategies for short- and long-term seasonal traffic management in Lyons. Join the consultants from Design Concepts and Town Staff to discuss the use, treatment and management of the small buy-out lots that are tucked in between existing residences. This information will be presented in the form of a Neighborhood Licensure Handbook. While neighboring property-owners will have the first opportunity for licensing the use of (all or portions of) these lots, this will be a great opportunity for everyone who is interested to learn how the licensure program buy-out properties will work. The Town of Lyons is developing and improved assessment of hazards and risk as a basis for further hazard mitigation projects and resilient land use planning. On Friday, March 31st, 2017, Sheriff Joe Pelle rescinded the fire ban that was in place for western Boulder County. The lower temperatures and additional moisture the area's received has decreased the wildfire danger to our community. Residents are also reminded that although the fire ban has been rescinded, there are still permit requirements in place for slash burning and broadcast burns, also known as prescribed fires. Permits are available online at: www.bouldercounty.org/safety/fire/pages/openburnpermit.aspx or at the Boulder County Sheriff’s Office Headquarters, located at 5600 Flatiron Pkwy., Boulder or the Sheriff’s Office Fire Cache, located at 3116 Longhorn Rd., Boulder. For current fire and shooting restrictions for United States Forest Service properties, please visit the following website: www.fs.usda.gov/alerts/arp/alerts-notices. For current fire restrictions in Eldorado Canyon State Park, please visit the following website: http://cpw.state.co.us/placestogo/Parks/eldoradocanyon. Six-hundred annual fishing permits for Ralph Price Reservoir at Button Rock Preserve go on sale on a first-come, first-served basis beginning at 8 a.m. on Monday, April 3, 2017. Ralph Price Reservoir, Longmont’s primary water supply located two miles within Button Rock Preserve, is open for fishing by permit only from May 1 - October 31. Annual permits cost $20 for City of Longmont and Town of Lyons water utility customers and $30 for non-utility customers. Anyone may purchase a fishing permit on behalf of another person; however, there is a limit of four annual permits sold per person, per day. In addition, a valid Colorado state fishing license must be presented at the time of purchase for each permit; neither photocopies nor mail-in applications are accepted. Youth ages 15 and younger are not required to hold a fishing license or a fishing permit as long as a permitted angler accompanies them. An additional 100 daily fishing permits will go on sale in Longmont beginning Thursday, June 1 for $10 per licensed angler, per day. These daily permits are valid for any chosen day between June 1 and September 30. Get all the details, including where and how to purchase, at LongmontColorado.gov/parks or by calling (303) 651-8416. The Town of Lyons Department of Parks, Recreation & Cultural Events will be reinstating a parking fee for LaVern Johnson Park in 2017. A parking fee of $5 for every 4 hours for those who wish to park in LaVern Johnson on weekends and holidays, from April 1 through October 15. One free resident parking pass will be issued to one vehicle per household that signs up. A second pass may be obtained for $35, and third pass is $55. Non-residents may purchase a season parking pass for a flat rate of $75.00 per vehicle. Vehicles must have the parking pass displayed at all times when parked in LaVern Park to avoid a violation fee. During the summer season, vehicles without a parking pass will be charged $5 for every 4 hours, which can be processed at the kiosks located throughout the park. Golf carts are required to pay parking fees, as well; residents may use the one free parking pass on golf carts. Resident parking stickers will be mailed once proof of residency and vehicle information is provided at Lyons Town Hall or on the Town of Lyons website. Residency is proven by showing a Town of Lyons utility bill. To sign up for a parking pass, visit Lyons Town Hall or apply online at the following link: www.townoflyons.com/157. The Latest Self-Guided Tree Tour Guide Has Arrived! Thanks to the hard-working members of the Lyons Ecology Advisory Board, a new Lyons Walking Arboretum guide is available! Complete with a self-guided tour map, and illustrations by Ecology Advisory Board member, Garima Fairfax, the Lyons Walking Arboretum guide offers an appealing way to learn about the trees in the community. Check out the Lyons Walking Arboretum Guide! The Lyons Ecology Board has chosen "Super Hummingbirds" for our next community film evening "Super Hummingbirds" will be shown on Friday, April 7th, at 7 pm, at the Lyons Farmette, 4121 Ute Highway. After the movie, a speaker from our local Greenwood Wildlife Center will be available to answer questions about local hummingbirds in our gardens. The movie is free, and all are welcome. Light refreshments will be provided. 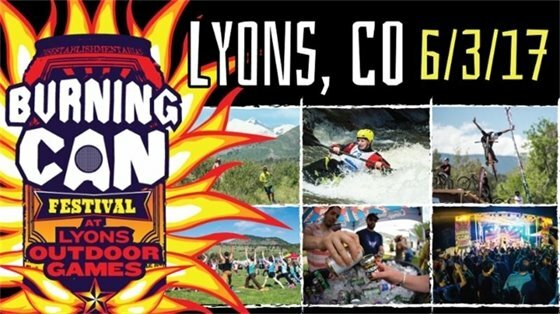 The collaboration between the Town of Lyons and Oskar Blues to produce Burning Can Fest 2017 at the Lyons Outdoor Games is the perfect culmination of both. With 50+ craft breweries, trail running, biking, kayaking, yoga, kids zone and on-site camping, attendees can make a whole weekend out of it. Rocky Mountain revelry will ensue with music from The Humble and headlining act Rubblebucket, plus Colorado craft cuisine from a half dozen food vendors. Check out the schedule of events, and get your tickets today! Be on the lookout for more Burning Can Festival at Lyons Outdoor Games announcements.